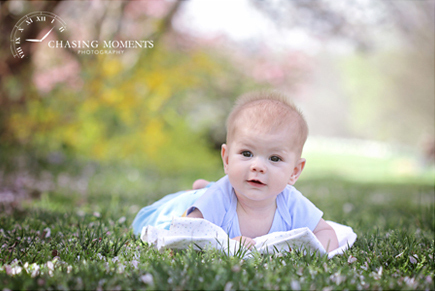 Booking information update: Chasing Moments Photography currently does not accept outdoor family photo session clients. Where and when: My outdoor family sessions take place seasonally (March-June, and September-November, other months weather permitting – so if you are looking for a wintry snow session or a summer spinkler/pool session at your backyard – please do email me!) on weekday mornings. At this time, I only shoot at two locations: Meadowlark Botanical Gardens (for full family portrait photography sessions) and around Reston (for short, 20-30 minute mini sessions, which are great for updating kids photos, or for couples, engagement, or maternity photo sessions). I am also available for sessions at Colvin Run Mill. Please keep in mind that during high peak seasons for outdoor photography (April f0r flowers and cherry blossoms, and October for fall colors), my availability sells out for weeks in advance, and I only shoot 1-2 weekend days a month (so if you want a weekend session, please book yours early). During most outdoor photo sessions I include a combination of posed, semi-posed, candid/casual portraiture (great for small children! ), depending on Client’s preferences. I always do a phone consultation before each outdoor session to understand kids’ personalities, get to know parents’ likes and priorities and to discuss the flow of the session and answer any questions. What to wear: your photographer loves shooting both simple/classic and fun, bright, colorful outfits! If you prefer simple and classic, try to stick to simple matching outfits with 2-3 colors (for example, white tops and blue jeans, or matching dresses for moms and daughters) . If you like a colorful palette, feel free to go wild! Everything goes – colors, patterns, stripes, polka dots, fun accessories and jewelry. Please keep in mind that no two photo sessions are alike. Every photo shoot has its own flow and dynamic. Please don’t worry about your child’s behavior or attitude during the session. Don’t worry if you need to take time for a feeding, comforting or an outfit change. Babies and young children photograph best when they act naturally and I try to capture them at their best just the way they are! As for adults – your photographer loves to meet different people, she will respect your space, personality and preferences! If your photo shoot involves children please bring: a couple of favorite age-appropriate activity toys (doll, game, rattle, sound toy , coloring book or favorite book, blocks). Some parents like to bring an extra scarf/jacket for a layered look and to add some variety. Parents, please bring snacks and juice or water!!! Please don’t forget to check out my article on LSI PRO on how I work with parents to prepare for outdoor family photo sessions .